Albert B. Fall, Secretary of Interior under President Warren G. Harding, was convicted on October 25, 1929, of accepting bribes from oil executives to lease federal oil reserves to their companies. Three properties were involved, but the resulting scandal—considered the worst in U.S. history until Watergate—carries the name of one of them, Teapot Dome. Albert Fall (born in 1861) was a Kentuckian, but moved to the West as a young man to relieve an ongoing respiratory condition (his or his wife’s is not clear). He worked in mining and studied law independently, entering the New Mexico Territory bar in 1889 and eventually practicing law in El Paso, Texas. He entered politics, serving first in the New Mexico Territorial House, then as a judge and finally as one of New Mexico’s first two U.S. Senators, elected in 1912. He served in the senate until 1921, when President Harding appointed him Secretary of the Interior. Many were skeptical of Fall’s appointment, knowing of his bias for commercial development of natural resources and his close friendship with oil executives. Gifford Pinchot, who had founded the U.S. Forest Service, was particularly suspicious of Fall. Fall proposed moving the Forest Service from Agriculture to Interior, a move that Pinchot fought aggressively—and which never occurred. During the Taft administration, the government had created a series of naval oil reserves in western states, administered by the Secretary of the Navy. The reserves were established as protection for the fuel needs of the Navy, but the administrative language gave great latitude to the Secretary for their operation. Fall realized the great financial opportunity associated with the oil reserves. While the public’s attention was focused on the question of the transfer of the Forest Service, Fall quietly convinced the Secretary of the Navy to transfer the management of the reserves to the Department of the Interior, citing his experience in the industry. Together, they acquired President Harding’s approval, as he noted he had heard no public outcry about this, as he had for the Forest Service. Two reserves were in California, and a third, the Teapot Dome, was in Wyoming. 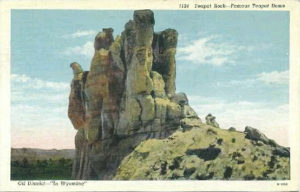 Teapot Dome was named for a geological formation in the reserve. Almost immediately, in early 1922, Fall made deals with two oil companies to lease them the oil reserves in exchange for bribes, gifts and loans (never intended to be repaid). Fall received over $400,000 in illegal payments. The oil companies got exclusive rights to the oil, which has been estimated as a $100 million windfall. Estimates also show that the U.S. government could have received $10-50 million in additional revenue had the leases gone through a competitive bidding process. Pinchot immediately began lobbying for an investigation. Within a few months, the Congress appointed a special counsel to investigate the accusations of bribery and illegal leasing. Fall resigned as Secretary of the Interior in early 1923, and he was indicted in 1924 along with several others. The trials dragged on for years, but Fall was eventually convicted of bribery on October 25, 1929, and sentenced to one year in prison. The reserves were returned to the Secretary of the Navy, and the leases were cancelled. For the next fifty years, Teapot Dome was the epitome of federal mis-management of federal resources, both natural and fiscal. At the time, one senator called the scandal “the slimiest of slimy trails beaten by privilege.” President Harding has gone down in history as a poor manager, allowing a cabinet of disreputable scoundrels to run the government. The revelations associated with Teapot Dome and other scandals is considered a contributing factor to the unexpected death of President Harding in August, 1923. Bennett, Leslie E. One Lesson From History: Appointment of Special Counsel and the Investigation of the Teapot Dome Scandal. Brookings Institution. Available at: http://academic.brooklyn.cuny.edu/history/johnson/teapotdome.htm. Accessed October 24, 2017. Encyclopedia Britannica. 2017. Teapot Dome Scandal. Available at: https://www.britannica.com/event/Teapot-Dome-Scandal. Accessed October 24, 2017. Ohio History Central. Albert B. Fall. Ohio History Connection. Available at: http://www.ohiohistorycentral.org/w/Albert_B._Fall. Accessed October 24, 2017. Oil Stories and Histories. 2005. Scandal: A Short History of the Teapot Dome Affair. Available at: http://oilstorieshistories.blogspot.com/2005/09/scandal-short-history-of-teapot-dome.html. Accessed October 24, 2017.